Hey guys! 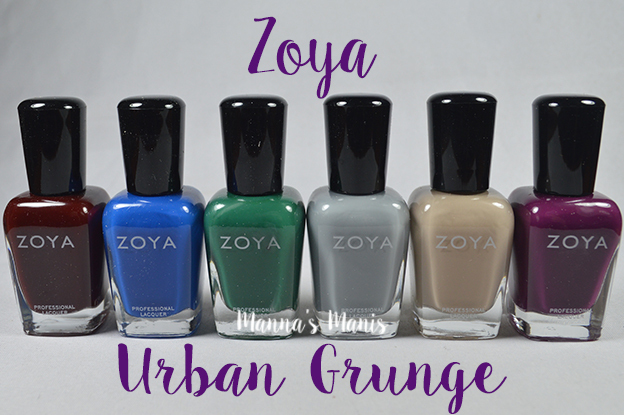 I'm back today with the second half of Zoya's fall collection. The other day I reviewed their stunning metallics & holos and today I'm going to show you the creams! I gotta say before we start, I apologize profusely for the dust on the bottles. I'm guessing it's dust from the box that the polishes came in, I took them out and put them back in there 3 times. I didn't notice it while I was swatching, but I kept trying to wipe them down to no avail I guess. Oh well! On to the swatches. NOAH is described as a mid-range taupe evenly balanced between yellow and grey. I didn't care too much for this one, formula was thick and I couldn't work it very well. Brush strokes are visible, which is a huge peeve of mine. These are described as 1 coaters, but you will see I had to do 2 coats for all of these for evenness. AUGUST is described as a full coverage gray like a fine, expensive leather with a mid-ranged, balanced tone. Again, not crazy about this one. Formula was a bit better, but again with the brush strokes. This did not fully cover in one coat for me. Shown below is 2 coats. WYATT is described as a true racing green with a deep pigment. This shade is the clear winner for me in this collection as far as formula and color. Shown below is 2 coats. COURTNEY is described as a deep red beet root shade. Formula was good, but this one is a STAINER! Big time. It took forever to clean up my cuticles to get a halfway decent photo. Shown below is 2 coats. TARA is described as a purple plum with a balanced tone between red and purple. 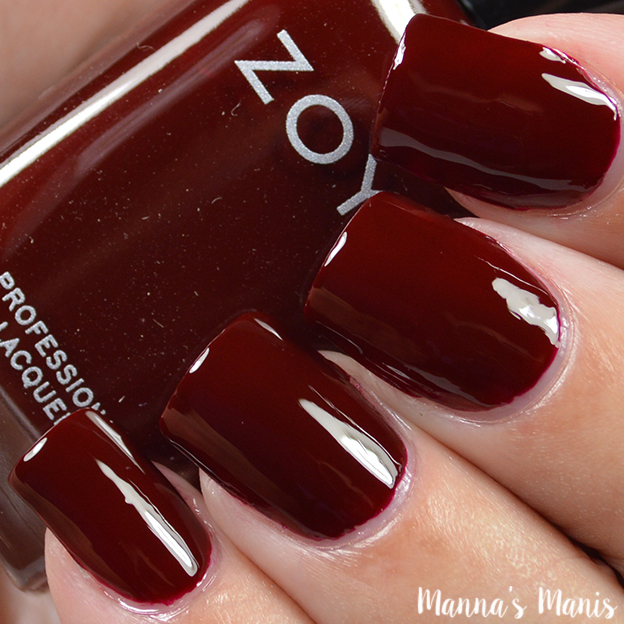 Beautiful shade, good formula and application. Shown below is 2 coats. MALLORY is described as a full bodied, vibrant Prussian blue with a deeply saturated color. 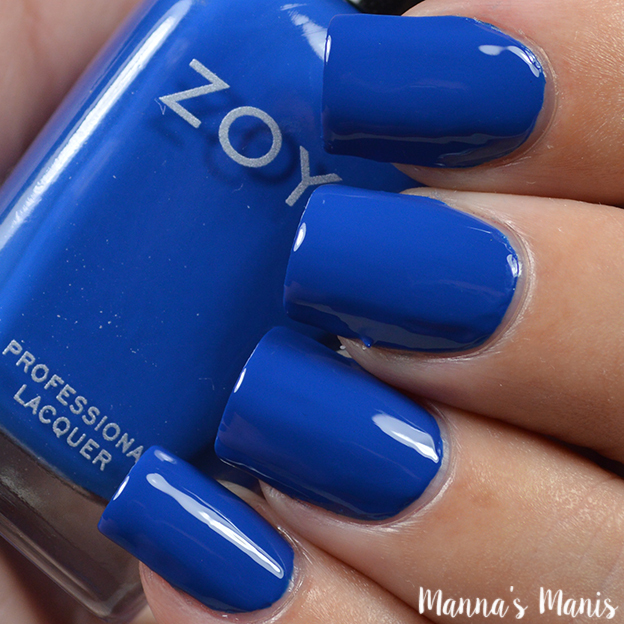 Stunning shade, very similar to other blue cremes from Zoya. Good formula and application. Shown below is 2 coats. If you can only get one of the 6 piece collections for fall, I would definitely choose the metallics & holos, and not the creams. I don't like polishes labeled "1 coat creams" because formulas tend to be thicker and harder to work with. They also are hardly ever really one coaters, because if you're not a complete expert at applying polish, you will need 2 coats to even things out and get rid of brush strokes. Overall I'm kinda "meh" about these creams!